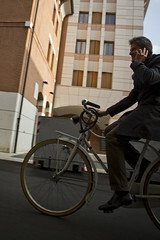 While walking through Ferrara, Italy, I was snapping photographs of the many bicycle users. I snapped snots of these two. Moments later I realised they were looking for each other and caught the moment when they made visual, rather than telephonic, contact. And off they went on their bicycles together. 'And off they went on their bicycles together. 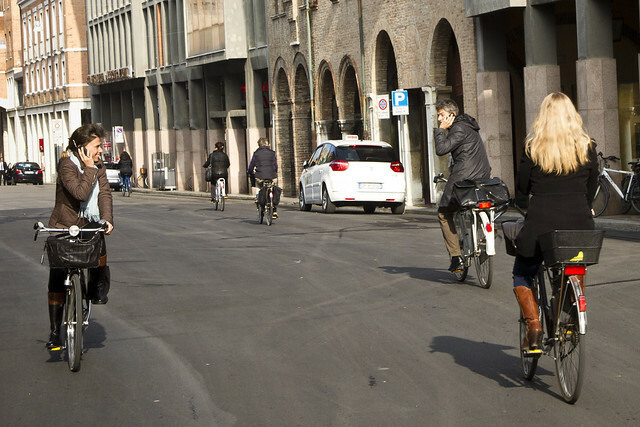 '....with only love in their eyes for each other as their faithful 2-wheelers smoothly and silently rolled into the Italian light of that beautiful life of a cycling-duo-togtherness. Excuse me ... I have to go now to find my box of tissue, my bike and cellular-phone. Max, Damien, Jack, Kyle ...... call me, huh! Mikael, I laughed with sheer delight when I saw that picture! This is classic: you must turn it into a poster. No captions, no comments needed. I will buy a copy. Or maybe even several. Thanks for sharing these pictures. Really these pictures should be framed and placed on a wall. Good collection. i love these pics...and i love how you "snapped snots" instead of shots! That's too perfect! You have a knack for catching magical moments like this.